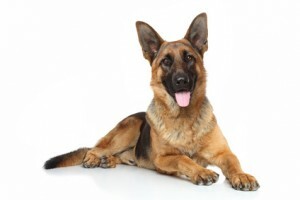 What Is The Best Dog Food for a Large Breed Dog? They may not fit in your purse, your lap, or at the foot of your bed, but large breed dogs are some of the most beloved household pets, from Collies to Cane Corsos and Labs. Whether you’re already a loving parent of a Golden Doodle, or you’re interested in adopting a Husky puppy, this guide will help you choose a healthy, delicious food for your large breed dog. There’s nothing cut-and-dried about determining the right diet for a large breed dog. One bag of grade A, nutrition-packed dog food may work wonders for a 50-pound Dalmatian but skimp in comparison for a 200-pound Great Dane, which is why it’s essential to try out different formulas until you find one that is best suited for your pet. Some breeds are quite active, while others spend most of their time resting, so your dog’s diet will depend on his or her activity level, as well as factors like weight, size, age, and metabolism. According to the National Research Council of the National Academies, an active adult dog weighing 70 pounds requires an average daily caloric intake of 1740 calories. Dogs that have been spayed/neutered, are older, or are less active may need slightly fewer calories. After you choose a dog food with quality ingredients, you’ll need to develop a feeding routine for your large breed dog. 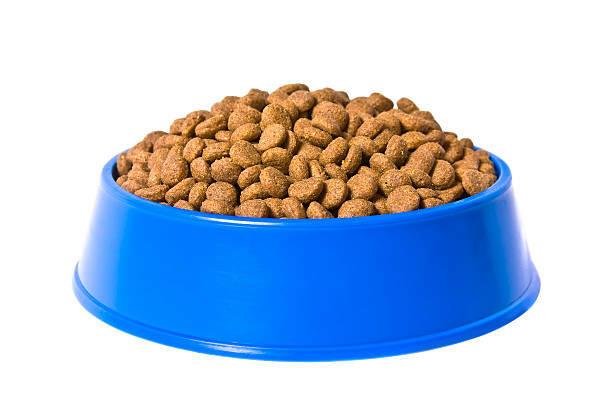 We suggest avoiding free-feeding and opting to measure out your dog’s meals two to three times a day. Leave each meal out for only an hour and a half to give your pet time to finish the food. Try to avoid formulas that contain common allergens (corn, soy, wheat), excessive protein, excessive carbs, by-products, fillers, sweeteners, artificial flavors, and preservatives. There is no magic bullet when it comes to your dog’s diet, but we’ve selected a variety of top-selling, nutritious foods that are popular among large breeds. Keep in mind, your dog’s diet may need to change as he or she grows and ages from a puppy to a senior dog. Based on the recommendations, here are our top picks for large breed puppy food. These USDA-inspected ingredients are delivered fresh each morning to the Fromm family facilities in Wisconsin and are free of corn, wheat, and soy. With the correct calcium to phosphorus ratio, as well as added DHA-rich salmon oil, we’re confident in the Fromm Large Breed Puppy Gold Formula to nourish your growing dog. 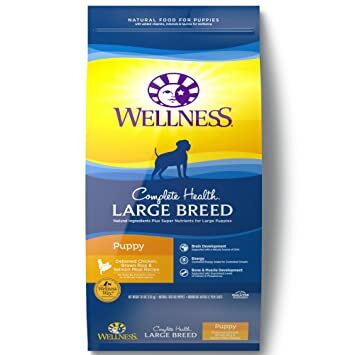 The Wellness Complete formula is power-packed with nutrients to support a developing large breed puppy. The ingredients contain flaxseed for a healthy coat and skin, taurine for heart support, and DHA for proper brain development. The formula is also recommended for pregnant and nursing mothers. As a large breed dog becomes full-grown, he or she will need to transition to a new diet, including an adult or all life stages dog food. Typically, a large breed adult dog should eat two meals each day, split between 1740 calories and containing quality sources of protein and fat. 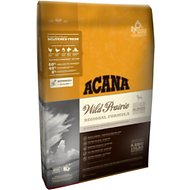 The ACANA Wild Prairie Regional Formula is an all life stages food loaded with natural ingredients and added benefits. Made in the company’s state-of-the-art facility in Kentucky, the formula is grain-free, high in protein, and low in carbs. Highly active large breeds will benefit from ingredients like glucosamine and chondroitin for joint support, omega-3 for healthy skin and coat, and vegetables and botanicals for digestion. 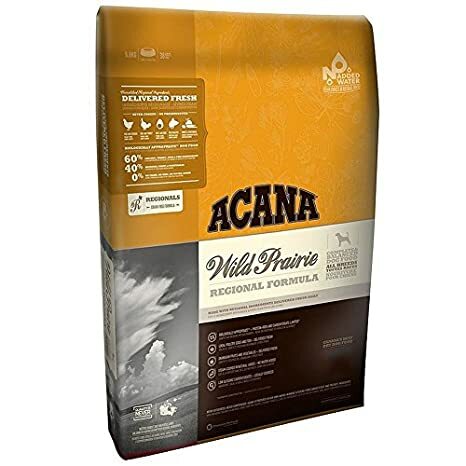 Because of its high protein levels, this grain and gluten-free formula is catered to active large breeds, as well as dogs with allergies. Refraining from the use of artificial colors, flavors, and preservatives, the all life stages food supports digestive and immune system health. 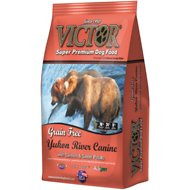 If your large breed enjoys fish, give this Victor Yukon formula a try. Made from fresh turkey, salmon, and duck, this formula is free of common allergens and irritants like corn, wheat, soy, gluten, beef, by-products, and artificial preservatives. Now Fresh Grain-Free features stellar benefits like New Zealand green mussels, glucosamine, and chondroitin for healthy joints; added L-Carnitine for a healthy heart and lean muscle; taurine for healthy vision and heart function; and added pre- and probiotics for improved digestion. 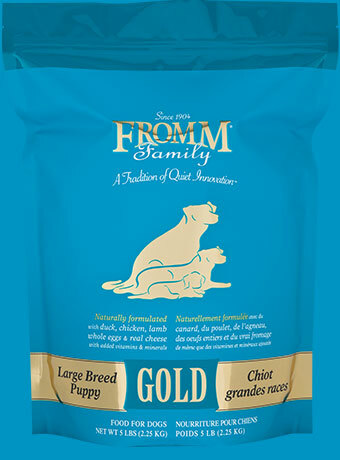 Designed specifically for large dogs over 50 pounds, Fromm Large Breed Adult Gold is one of our favorite selections. Chicken cartilage is added for a natural form of glucosamine to keep joints supple, and the food is easy to digest since it’s free of wheat, corn, or soy. Plus, Fromm is a family-owned company in Wisconsin, and they make their food in small batches every morning. Many large breed dogs live into their teen years, so you’ll need to adjust their diet as necessary. Large breed dogs are susceptible to obesity as they age, so part of this adjustment may include decreasing meal sizes or opting for a lower-calorie food. However, limiting portions can cause your dog to skimp on protein and lose muscle tone. If your dog is losing muscle strength, look for a senior dog food that has a higher percentage of protein. High amounts of protein are perfectly healthy unless he or she has kidney issues. By limiting portions and increasing exercise, your older dog can be perfectly healthy. With high levels of quality protein, Orijen Senior helps maintain muscle strength as large breeds age and become less active. Made of 80 percent meats and fish, the food is low-glycemic and low-carb to help keep blood sugar steady. The food also contains natural sources of glucosamine and chondroitin to keep joints healthy. Feeding your large breed dog a nutritious, high-quality food is a great way to keep him or her healthy over the years, but there are other common dietary and health issues to consider that can’t be tackled with a healthy food alone. Commonly, large breed dogs suffer from obesity as they get older, which puts added stress on their joints and bones and increases the likelihood of developing arthritis, elbow dysplasia, or hip dysplasia. If your large breed dog is suffering from one of these diseases, get in touch with your veterinarian to discuss specialty dog food options and other treatments. What Is The Best Dog Food for a Goldendoodle? I have 2 Goldendoodle puppies that are 8 months old and at around 65 pounds. They have an intolerance to chicken by product so at 4 months old we started feeding them nature’s variety limited ingredient. They did great on it! However that is an all life stages food. Now I’m reading articles that all large breed puppies should absolutely eat large breed puppy food until 18 months old. I feel like my puppies have been growing at a slow rate (my sisters puppy who is 2.5 months younger than them has surpassed their size) and they never went through the awkward puppy stage. Even the vet is impressed with how every part of them seems to be growing at the same pace. I’m worried from all these articles that I screwed up and should have fed them LBP. I have two danes and they are now 15 months old. The male we have had dermadectic mange problems with for a while now, even though I think we have that under control, but he is still loosing hair and itches. Our female has developed hives, thus a skin infection. She has completed her meds, I stopped the prednisone, I have read that this is the time they start deleting allergies. 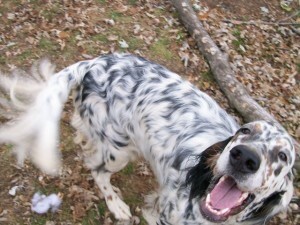 I have them on Natural Balance Salmon and Sweet Potato, I had them on a chicken dog food before. She still has the hives and they are both itching. I do not want to spend a lot on food. The vet recommend Kirkland Salmon and sweet potato from Cosco. 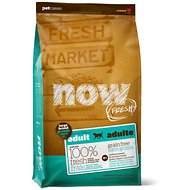 I have been looking at the Simply Nourish line from PetSmart. Then someone told me to go to Tractor Supply and look at their brand. Im trying to find the one with the least amount of protein and of course the calcium and phosphorus have to be right. 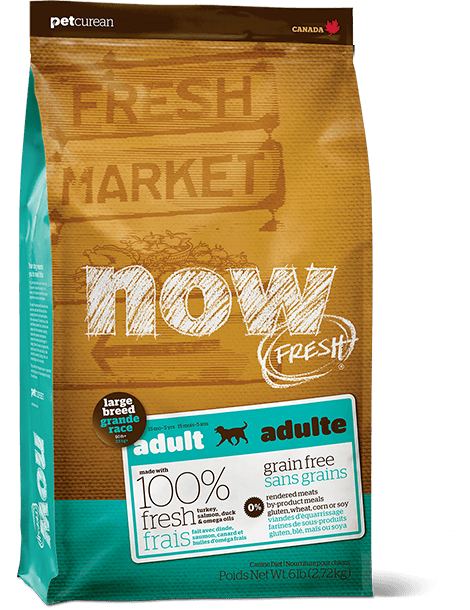 I started them off on Nutri Source Lg Breed Puppy food then went to Natural Balance then I tried a Lg breed dog food put out by the actor that played Robin in Batman. I went back to the NB and took them off chicken. Please help me find a happy medium.